Reddit is a social news aggregator and ranks as the 7th most popular website in the world, receiving an average of 18 million visitors per day. 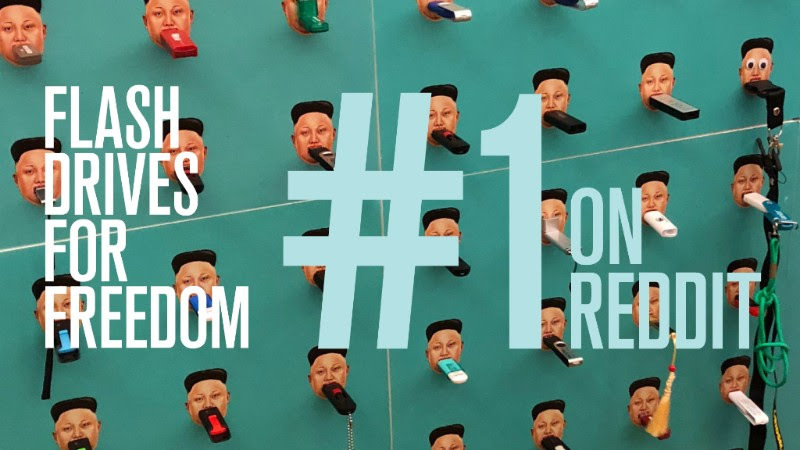 A significant percentage of those visitors came across HRF’s work to promote human rights in North Korea, as more than 65,000 users voted the photo to the top of Reddit‘s front page as well as to the top of a number of other subreddits. As a result, more than 2,000 comments have been published discussing this intersection of technology and human rights and the impact of sending news and entertainment into a closed-information environment like North Korea. The photo was originally taken last week in Las Vegas at DEF CON – the world’s largest hacktivist convention – where HRF annually visits to share its work with technologists, software developers, and information security experts. This year HRF featured Flash Drives for Freedom, an initiative we founded in 2016 to disrupt Kim Jong-un’s propaganda machine by collecting USB drives, loading them with pop culture, news, and video content, and getting them into the hands of the North Korean people, who are prevented from accessing the internet. The exhibit was very popular, sparking several viral social media posts, including a widely-shared tweet from the founder of the Monero cryptocurrency. As the world’s interest in North Korea dissipates following summits between North Korea’s dictator and the presidents of South Korea and the United States, HRF’s work to promote freedom in North Korea has intensified, as we continue to flood the country with information and technology. To date, HRF has been able to – with the generosity of donors from around the world and expertise from North Korean defector organizations – send more than 60,000 USB sticks into North Korea. Beyond the front page of Reddit, the campaign has been featured in Time, BBC News, CNN, WIRED, MSNBC, Fast Company, The Economist, Reason TV, PBS, Quartz, Fox News, The Globe and Mail, The New York Post, PC Magazine, The Guardian, Business Insider, USA Today, and many other international media outlets, informing tens of millions of people about how anyone can get involved in the struggle to promote human rights inside North Korea. To receive more detailed updates about our North Korea work, please email fdff@hrf.org, and follow HRF on Facebook, Twitter, and Instagram. You can also watch a video about our North Korea work here.